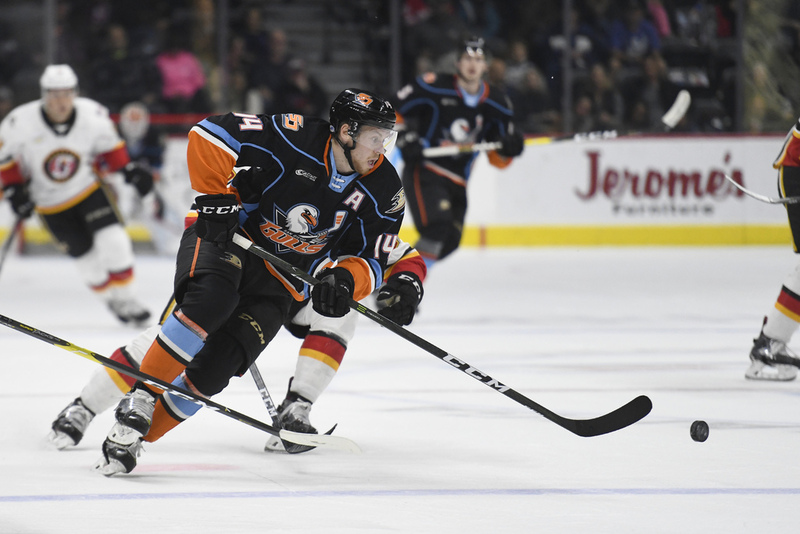 A two-goal second-period lead disappeared as the San Diego Gulls allowed the next five goals in a 7-5 loss to the Stockton Heat on Wednesday evening at Pechanga Arena San Diego in the third meeting between the teams in six days. Adam Cracknell gave the Gulls a 4-2 lead six minutes, 35 seconds into the second period with an unassisted goal. Stockton began its comeback 49 seconds later when Ryan Lomberg scored from the right faceoff circle off Matthew Phillips’ assist. The Heat tied the score at 15:57 of the second period when Tyler Graovac put a slap shot from the left faceoff circle past Jeff Glass for his 19th goal of the season. Stockton took the lead for good when Dillon Dube scored from the right faceoff circle with 43 seconds left in the third period, four seconds after Steve McParland’s holding penalty expired. The Gulls hoped to tie the score when Heat center Alan Quine was called for interference with 10:25 left in the third period. However, Stockton increased their lead to 6-4 on Lomberg’s shorthanded goal with 8:42 remaining. The shorthanded goal was the Heat’s second in its last three games. Glenn Gawdin scored a shorthand goal in the Heat’s 5-2 victory Friday. Rinat Valiev scored a shorthanded empty-net goal with 2:20 to play for Stockton. Corey Tropp scored a power-play goal for the Gulls with 27 seconds left. The Gulls (30-18-3-3) got goals from Cracknell, Kalle Kossila and Andy Welinski on their first three power plays. They scored on four of their eight power-play opportunities. The Heat (24-26-4-1) were scoreless on their five power-play opportunities. The Gulls led 34-30 in shots on goal before a crowd announced at 6,218. Glass allowed six goals on 29 shots, four nights after stopping all 20 shots in a 3-0 victory over Stockton, the Calgary Flames’ American Hockey League affiliate. Heat goaltender Jon Gillies (12-15-4-0) made 29 saves and assisted on Valiev’s goal for his third point in the past three seasons. Stockton left wing Kerby Rychel opened the scoring 6:19 into the first period for his team-leading 22nd goal of the season. The Heat tied the score, 2-2, on Scott Sabourin’s goal with 1:20 left in the first period. Tesink did not play Wednesday. He was scoreless in the Gulls season opener Oct. 6. Tesink has 23 goals and 31 assists in 58 games with the ECHL’s Tulsa Oilers this season. Since Saturday’s game, the Gulls NHL parent team, the Anaheim Ducks, recalled two players from the Gulls — center Sam Steel, who scored twice Saturday, and defenseman Jacob Larsson. The Gulls will play host to the Colorado Eagles, the Colorado Avalanche’s AHL affiliate, Friday at Pechanga Arena San Diego.